This Built Bar review was inspired by a bunch of comments on a previous post. I wrote What Are the Best Protein Bars for Weight Loss? based on all the bars that looked good at my local Whole Foods. I was looking for bars that tasted good, had a high amount of protein, and weren’t high in calories. Two years ago, I took a look at thinkThin here: thinkThin High Protein Bars Review. Built Bars are only 3 points for the whole bar, not that I would eat it at once. I purchased the Double Chocolate Mousse, Chocolate Raspberry Creme, and the Chocolate Strawberry Creme. They have a marshmallowy consistency when you bite into them - delicious. I've also tried cutting them up into 6 pieces and putting them into the freezer. Feels like a little treat to grab a piece. How could I not try them? Marshmallow? Treat? In a protein bar? I was pretty excited when my box arrived. The only way to buy them is online at Built Bar and that is probably why I hadn’t seen them before. I bought a sample box of 6 bars for $9.95 BUT you can only buy this once. If you fall in love and want another mixed box, you can buy 18 bars for $36. Somehow the makers of Built Bar made a product that reminds me of a 3 Musketeers bar but it doesn’t have sugar or fat. The texture is like a marshmallow and it is wrapped in chocolate. The chocolate actually tastes like chocolate - no small feat in the protein bar world. I tried a couple of flavors - the chocolate mousse (photo above) and the raspberry chocolate creme. I liked the raspberry flavor better. I don’t like mint and chocolate so I knew I wasn’t going to like the mint chocolate creme which tasted like toothpaste. What can I say? I think these are better cold but they taste pretty good for what the ingredients might indicate. Initially, I thought they would taste like a science experiment but they remind me of candy. I am actually surprised about how much these tasted like a childhood treat. As an adult, my treats have gotten more sophisticated (think dark chocolate squares) so these don't hit my happy spot but I can see how people would love these. I have a small reaction to erthritol (tummy trouble) that I did not get with these bars probably because they don’t use that much of it. I would not eat two in a day just to be on the safe side. Overall, I think these are a good choice especially if you are a candy lover and want to wean yourself off of it. I like the idea of slicing these bars into pieces and having a chunk when you are craving something sweet. That way, you don’t eat too much of it at once and you save yourself some money. Do I think these are the best choice? I would still try to go with unprocessed food (like an apple with peanut butter) when you can. But, I would stash one of these in my purse for those long days when I can’t bring along something fresh. 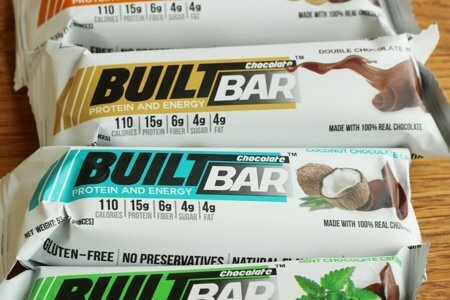 Have you tried Built Bars? What is your review? I absolutely LOVE these bars. Coconut is my favorite. My husband likes the salted caramel. It's a great bang for your 3 WW points buck! 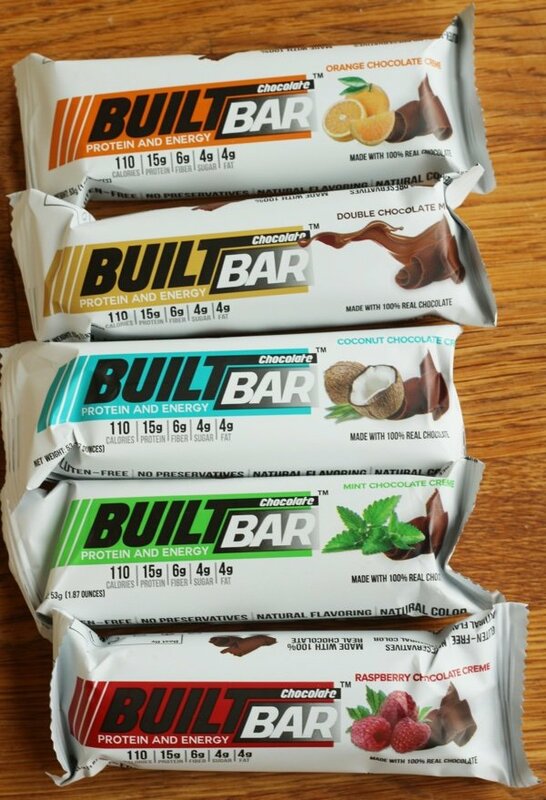 I had never heard of the Built bars until your protein bar review. I love the Built bars! The coconut is my favorite. The consistency reminds me of a cream filled Easter egg. And unlike other bars, I don’t get the digestive issues that I do with most bars. I’m on my 2nd full order. I just wish they were available in the stores. Thanks snack girl for your product reviews! I’m that rare bird that doesn’t fancy them. One bite, and I taste chemicals. I have 2 boxes gathering dust in my kitchen. I would rather have an apple with peanut butter. I want to try these, but unfortunately, they aren't vegetarian-friendly. They look and sound so good! $2.00 is too much for a protein bar. I really wanted to like these after hearing how wonderful they are. After all they look so good and they are low in points... I’m sorry to say that I found them to be disgusting! I thought maybe it was just the first bite so I took another bite and proceeded to throw the rest of the bar away...Now I have almost a whole box that I paid good money for! Have to add my two cents worth. I love the flavor of the bars (I also tried the mixed selection) but I can’t get past the consistency. I tried them cut into pieces and frozen- dangerous for me with crowns and fillings; I ended up trying to let them melt in my mouth. That’s impossible, they are too gelatinous. As much as I like the flavor, i won’t order them again due to the consistency. I actually do love mint and chocolate together, (Andes mints and York peppmint patties are some of my faves!) and I found some Special K protein bars at Walmart in the granola bar area and they are a new fave! They have that same fluffy inside consistency you’re talking about. I grab those as a treat instead of a candy bar to satisfy my sweet tooth. They’re not overly sweet, either. Think Andes mint with about 1/3 less sweetness in a candy bar format. Insides are like a 3 Musketeers bar. $5.50 for a box of 5. Only 8g of protein but works great for a snack. They’re on the bottom shelf at my Walmart so you may have to hunt if you want to try them! Thanks to everyone for sharing their perspective. I did not find the consistency off-putting but I can see how one would. These are a love them or hate them kinda product. I bought both the sample and a box of assorted. Some flavors I like and some not so much. Haven't tried them frozen yet. Expensive, but worth it when I'm working WW seriously. Erythritol is one of the few artificial sweeteners I can eat without digestive problems, but probably only 1 bar per day. I really love these bars. I especially love the Chocolate Moose and my second favorite choice is salted caramel. It's hard for me to believe that there are only three points. I usually eat a half at one sitting to help me ward off my cravings. I did not care for the lemon, raspberry, or chocolate mint. I highly recommend you giving them a shot. I really love these bars. I especially love the Chocolate Mousse and my second favorite choice is salted caramel. It's hard for me to believe that there are only three points. I usually eat a half at one sitting to help me ward off my cravings. I recently brought them with me for a trip to Russia and Israel and they were perfect, anytime I was hungry I would eat a half and it would really keep me full for like an hour. I did not care for the lemon, raspberry, or chocolate mint. I highly recommend you giving them a shot. By the way they are covered with real dark chocolate. Ugh erthritol. My body can't handle it at ALL. i think it's really dangerous, especially for people who have problems with food (as in, tendency to over-eat). It can make you REALLY ill. I'll pass on this, thanks! I bought the sample box and cut them into bite size pieces for my family to try. Unfortunately not 1 of the 4 of us really liked any of them. I didn't like them at all. Our favorite real food protein bars are SO EASY!!! 1 cup real peanut butter, 1/2 cup rolled oats, 1/2 cup flaxseed meal, 1/4 cup honey, dash of cinnamon and salt. I add 1/2 cup mix-ins like chopped dark chocolate or dried fruit. Press into 8x8 square pan and refrigerate before cutting into bars. So easy, delicious, and it's real food! Personally, I got burned out on protein bars years ago and prefer eating a banana with some nut butter, or cottage cheese with berries, or wilted greens with veggies and legumes in a chicken or veggie broth. Cheers! Snack Girl, I'm glad you gave them a shot. I agree with Dawn and Jessica, nothing can replace "real food" as a snack; however, there are times when you just can't carry/travel with fresh food. 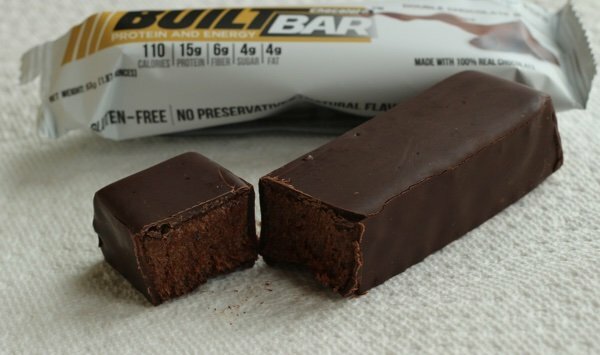 I don't believe in using processed food/protein bars as meal replacements, but in a pinch, I find a bite or two of the Built bar to be a great alternative - and it has a lot less calories than nuts which I love, but tend to overeat. I ordered these right away, and tried the chocolate moose (I love dark chocolate). I had put in the freezer for a couple of hours. I found it so delicious, and the texture was similar to the soy or cashew milk ice cream bar I would have had as part of my usual evening snack. I ate 1/2 of a bar and was satisfied. I'm going to try them all in the sample, then order my favorites. I am usually sensitive to sorbitol (gassy, bloating, etc...), but the erthritol didn't seem to bother me. Maybe because of only eating 1/2 a bar. I ordered the sample box. LOVED these! Especially the chocolate mousse and the vanilla.